Places are limited so pre-booking is essential! included: Towel hire, Silica Mud Mask & 1st Drink of choice. Included: Silica Mud Mask, Algae Mask, Use of Towel, Bathrobe and slippers, 1st Drink of choice, restaurant reservation (Optional), Glass of sparkling wine if dining! Please call the number supplied on your e-ticket at least 48 hours before your tour to reconfirm your pick-up time and location. Enjoy a day at Reykjavik’s best SPA! 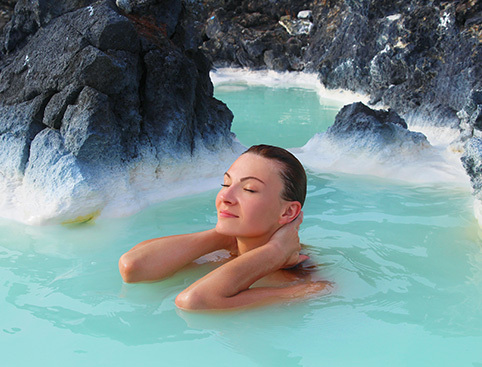 Treat yourself to a relaxing day at the Blue Lagoon – voted #1 SPA in Reykjavik by TripAdvisor! 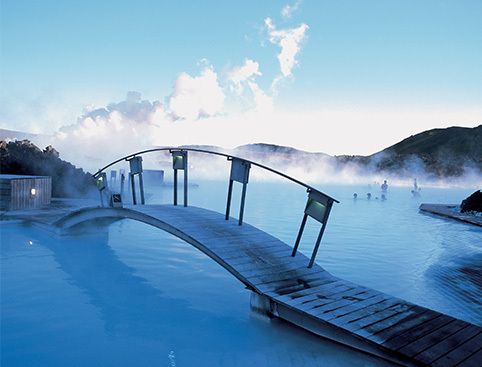 Situated in the youngest lava field in west Iceland, the Blue Lagoon definitely offers a view to die for. 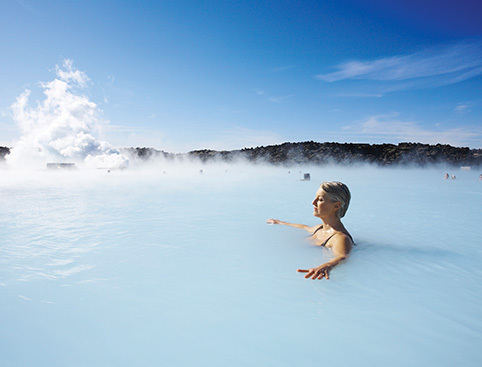 We’ll arrange your transport there & back from Reykjavik, so all you have to do is relax and enjoy a good soak in the geothermal water. 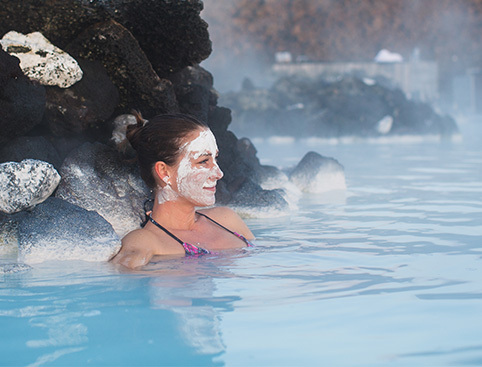 Pamper your skin with a silica mud mask – If you’ve seen photos of the Blue Lagoon, you’re bound to have come across a ton of people relaxing in the water with a white face mask on. This is the silica mud mask. You’ll find a bucket of it sitting by the pool - just help yourself! Shower in a waterfall – The Blue Lagoon’s man-made waterfall is a delight for sore shoulders and stiff muscles. Feels like heaven after an extreme Iceland tour! Fun Fact - the water’s not actually blue! That’s right - the dark blue-green colour you see is nothing more than the reflection of the water’s 3 core ingredients - Silica, Algae & minerals, in the sunlight. Finding it hard to believe? Just scoop some water from the Blue Lagoon in a plastic cup and see for yourself! Fancy getting there early, or rather sleep in late? Enjoy a day at your own pace - hotel transfers are available both in the morning and in the afternoon. Once you are at the Blue Lagoon, you can stay, as long as you like. Shuttles run from the Blue Lagoon to Reykjavik regularly up until 10pm. Your departure time will be allocated based on availability. This will be printed on your e-ticket. If you have a preferred departure time, please call us to make your booking. Please be ready for your hotel pick-up 45 minutes before your tour time. See the list of hotel pick up points to find out if your accommodation is affected. Parking: There is a large parking area where guests may park free of charge. Don’t forget to bring swimwear and a towel! The Blue Lagoon welcomes guests with special needs or disabilities. Please note that the bus can accommodate foldable wheelchairs, however passengers are required to climb steps (unaided or with the assistance of a travel partner) in order to board. COMFORT tickets Include: Silica Mud Mask, Towel hire, 1 free drink and Algae Mask. PREMIUM tickets include: Silica Mud Mask, Algae Mask, Use of Towel, Bathrobe and slippers, 1st Drink of choice, restaurant reservation ( Optional), Glass of sparkling wine if dining. In order to make your restaurant reservation should you wish to take this option up, please call the restaurant directly in order to make your reservation, details are found on the voucher. The admission fee to the Blue Lagoon is included in the price. Please note while children under 13 can travel free of charge on this tour we will need to reserve a place for them in the coach, so please remember to let us know how many children are travelling and how old they are. Pick-ups from several Reykjavik hotels and guesthouses have been affected by new restrictions imposed by Reykjavík City Council. 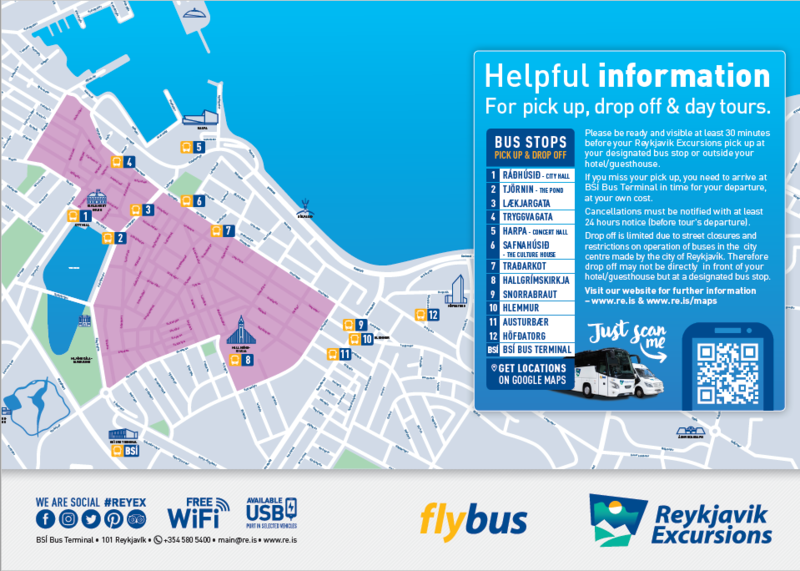 You will be assigned a nearby bus stop where your transport will meet you instead which is contained in the below link. To view pick-up points, please click here. Visit the link that you'll find in your voucher to download and print off a voucher for Reykjavik Rost. Located right by the old Harbor, Reykjavik Rost offers a selection of freshly made & grilled sandwiches with a delicious selection of soups. With our exclusive meal deal voucher you can save up to 25% off of your combo meal (Soup + Sandwich + Filter coffee). Delicious! 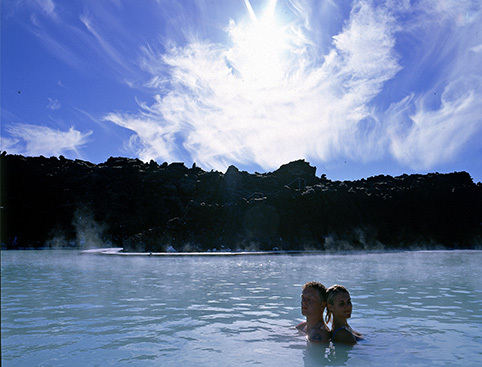 The Blue Lagoon - From Reykjavik is rated 3.0 out of 5 by 2.